Disclaimer: The views expressed are those of the author and do not reflect the official policy or position of the US Army, the US Department of Defense, or the US Government. 1 Much discussion has taken place in the last few years about the lessons learned from the American experience in Viet Nam and the applicability of these lessons to the contemporary challenges in recent conflicts in Afghanistan and Iraq. There are more differences than similarities between Viet Nam and the conflicts in Afghanistan and Iraq but that does not mean there are no useful lessons. Some of those lessons, particularly with regard to the US advisory effort in Viet Nam, might inform the contemporary problems advisors face in building indigenous forces in both Afghanistan and Iraq. 2 Before addressing lessons learned it is appropriate to consider the evolution of the advisory effort in Viet Nam. In the first phase of the mission, the US had little involvement. However, with the beginning of the Cold War, events turned from a war to re-impose French colonial rule in Indochina into a war to check the spread of communism in Southeast Asia, at least in the minds of US policy makers in Washington. The mission can be divided into five loosely defined phases: 1946-1954 during the First Indochina War; 1954-1956 with the French withdrawal from Viet Nam; 1956-1966 with the growing counterinsurgency campaign; 1968-1969 with the building of the South Vietnamese Army; and 1969-1973 with the implementation of Nixon’s Vietnamization plan. The mission ended in 1973 with the signing of the Paris Peace Accords and the withdrawal of all US forces. 4 After the French defeat at Dien Bien Phu in 1954 and the signing of the Geneva Accords, the French began their two year long withdrawal from Viet Nam. During this period, that marked the second phase of the US advisory effort, the Americans and French worked together to bolster the South Vietnamese armed forces. In February 1955, the Training Relations and Instruction Mission (TRIM) was established in Saigon. A Franco-American effort in the beginning, TRIM was formed to train the Vietnamese National Army (VNA). In November of that year Military Advisory Assistance Group, Viet Nam (MAAG-V) was established, replacing the Military Assistance Advisory Group, Indochina. By early 1956, the departing French had effectively handed over the mission of building the South Vietnamese armed forces to the Americans. With the French gone, the third phase of the US advisory effort began. US advisors were faced with the daunting task of transforming the VNA 2 into a viable force that could defend the fledgling Republic of Viet Nam against the growing insurgency. The VNA suffered from a number of serious maladies. The force was organized primarily into small units and concentrated in non-combat arms. Moreover, it lacked senior command experience and the senior officer ranks were highly politicized. Additionally, the VNA was rife with corruption. 5 In the face of such problems, the Americans had to determine what kind of army they wanted the VNA to be. Between 1957 and 1959, the Americans envisioned the Army of the Republic of Viet Nam (ARVN) 3 as a force that could maintain internal security and meet the threat of an external attack from North Viet Nam. 4 The force was built around divisions that mirrored US Army organizations. By the late 1950s, after more than 200 changes to the tables of organization and equipment, the objective force for ARVN became seven standard divisions of 10,450 men, each organized into three army corps. 5 In order to build this force, advisors were eventually assigned down to battalio level.These advisors were responsible for training, conducting staff operations, establishing a logistics system, and assisting in operational planning. At the outset, the US advisors were forbidden from accompanying ARVN forces on combat operations, but that restriction was loosened in mid-1961 as the insurgency continued to grow in strength and intensity. 6 In addition to those with the main headquarters and operational divisions, advisors were also assigned to the army service school and training system, which was built from the ground up. Still more advisors were working in the pacification effort at the district level and Special Forces teams rotated in and out of South Viet Nam working with mobile training teams and with the Montagnards under the CIA-sponsored Civilian Irregular Defense Groups (CIDG) program. On 8 February 1962, the Military Assistance Command, Viet Nam (MACV) was established to manage the growing US advisory mission. 8 It soon became apparent that there were other systemic problems in the US advisory program. In addition to the problems previously noted, individual twelve month advisor tours, which in most cases translated into even shorter tours, resulted in “revolving door advisors” who caused too much turbulence and impeded the development of trust and rapport and, by extension, the improvement of the advised units.8 In addition, short tours provided advisors with littleopportunity or incentive to tackle long-term problems. The entire advisory effort focused on the short-term problem of combat effectiveness of small units rather than addressing the more fundamental systemic problems such as command and control architecture, leadership, professionalism, and eradication of corruption.Compounding this situation was the problem of obtaining an accurate picture of ARVN’s progress because there was no standard method for rating the morale and combat effectiveness of Vietnamese units. 9 While the advisors tried to overcome these difficulties, they continued to labor in the shadows as the main focus of US energy remained in the fight against the Viet Cong and the North Vietnamese Army. 9 By 1963 South Viet Nam was in trouble both militarily and politically. Once the Communists realized that South Vietnamese Premier Ngo Dinh Diem was not going to conduct the elections called for in the 1954 Geneva Accords, it decided to turn to force of arms to achieve a reunification of Viet Nam under communist control. By 1959, there had been a steep increase in the size and strength of the externally supported insurgency growing in the south. The South Vietnamese military was routinely defeated in the field, while the Diem regime suffered from its own ineptitude and heavy handedness. In November 1963, the situation became more complicated as both Ngo Dinh Diem and President Kennedy were assassinated. By the end of 1963, there were over 16,000 US military personnel in Viet Nam, but there had been no appreciable progress against the insurgency. In late 1964, the Military Committee of the Politburo in Hanoi made a fateful decision to send main force units from the People’s Army of Viet Nam (PAVN) down the Ho Chi Minh trail to join the struggle in the south. 10 In Washington, President Lyndon Johnson affirmed that he would continue the course set by Kennedy. He faced the two-fold problem of dealing with an externally supported insurgency and what was effectively becoming an invasion from North Viet Nam. Under the auspices of the 1964 Tonkin Gulf Resolution, which effectively gave the president the authority to do whatever he thought necessary to stem the tide in Vietnam, Johnson attempted to use air power to convince the North Vietnamese Army (NVA) to abandon its aims and goals in the south. This had little effect, however, so Johnson eventually committed US ground troops. The first group of Marines was ostensibly sent to protect US airfields, but they soon found themselves conducting combat operations against the Viet Cong and PAVN. They were soon followed by additional deployments of US ground troops. By 1967, there were over 400,000 US troops in Viet Nam. As the number of American troops grew, General William Westmoreland, senior US commander in Saigon, put those troops in the field and told them to seek out and destroy the enemy main forces in what became a war of attrition. 13 On 31 January 1968, the communists launched the Tet Offensive, the outcome of which caused yet another shift in the American advisory effort. Although this offensive resulted in heavy losses for the Viet Cong and PAVN, 15 the offensive proved to be a psychological victory for the communists convincing many Americans that the war was a stalemate and that the administration should negotiate a way out. On 31 March, President Johnson, challenged from within his own party, made the surprise announcement that he would not run for re-election. This paved the way for Richard Nixon’s narrow defeat of Hubert Humphrey in the general election in November. Nixon initiated a policy in pursuit of what he called “Peace with honor” that had four components: the shift of responsibility for the war to the South Vietnamese (Vietnamization), a renewed emphasis on pacification, the withdrawal of US troops, and secret negotiations conducted by Henry Kissinger with North Vietnamese representatives in Paris. 16 By this time in the war, the US advisory mission and structure had matured from the earlier ad hoc approach resulting in a clearly defined architecture. US advisors were found in essentially three areas: advising South Vietnamese combat units, serving in the training base, and working in the province pacification programs. 17 Headquarters MACV provided the advisory function to the Joint General Staff, the senior headquarters of the RVNAF. However, only a part of MACV Headquarters staff personnel actually served in a true advisory capacity. In 1970, only 397 out of 1,668 authorized spaces in MACV’s fifteen staff agencies were designated officially as advisors to the government of Viet Nam and the South Vietnamese Joint General Staff. 20 Nevertheless, as the war continued and more US forces were withdrawn, the MACV staff agencies became increasingly more involved in advisory functions. 18 Just below the Joint General Staff level were four South Vietnamese corps commanders who were responsible for the four corps tactical zones, or military regions, that comprised South Viet Nam. Initially, their US counterparts were the senior commanders in each of the corps tactical zones. 21 In this capacity, the senior US commander was assisted by two deputies. His deputy for Civil Operations and Rural Development Support (CORDS) was the principal advisor to the ARVN corps commander in the area of pacification and development. The other deputy served as the senior advisor to the corps commander and was actually the chief of the US Army Advisory Group attached to the ARVN corps headquarters. As such, the deputy and his staff provided assistance, advice, and support to the corps commander and his staff on command, administration, training, combat operations, training, and intelligence, logistics, political warfare, and civil affairs. 19 Later, as additional US units and the senior American field force headquarters were withdrawn, the advisory structure changed. During 1971-72, three regional assistance commands were established. 22 The regional assistance commander, usually a US Army major general, replaced the departing senior US corps-level commander as the senior advisor to the South Vietnamese corps commander in the respective military region. The exception was in II Corps, where John Paul Vann, a civilian, was named the senior advisor. Since he was a civilian and technically could not command US military forces, his headquarters was designated Second Regional Assistance Group (rather than command). He had a military deputy, a brigadier general, who exercised command on Vann’s behalf. Otherwise, Vann’s group functioned the same as the other regional assistance commanders. 20 The mission of the regional assistance commanders was to provide assistance to the ARVN corps commanders in developing and maintaining an effective military capability. This was done by advising and supporting RVNAF military and paramilitary commanders and staffs at all levels in the corps in military operations, training, intelligence, personnel management, and combat support and combat service support activities. To accomplish this, the regional assistance commander had a staff who worked directly with the ARVN corps staff. He also exercised operational control over the subordinate US Army advisory groups and the pacification advisory organizations in the military region. As such, he and his personnel provided advice, assistance, and support at each echelon of South Vietnamese command in planning and executing both combat operations as well as coordinated pacification and development programs within the military region. 21 Below the senior US advisor in each military region, were provincial and division advisory teams. Each of the forty-four provinces in South Viet Nam was headed by a province chief, who was usually a South Vietnamese Army or Marine colonel, who supervised the provincial government apparatus and also commanded the provincial regional and popular forces. Under the Civil Operations and Rural Development Support (CORDS) program an advisory system was established to assist the province chiefs in administering the pacification program. The province chief’s American counterpart was the province senior advisor, who was either military or civilian, depending on the security situation of the respective province. The province senior advisor and his staff were responsible for advising the province chief in civil and military aspects of the South Vietnamese pacification and development programs. The province senior advisor’s staff, which was made up of both US military and civilian personnel, was divided into two parts. 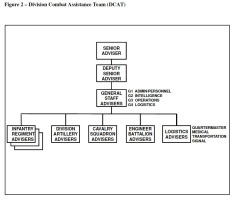 The first part dealt with area and community development that included public health and administration, civil affairs, education, agriculture, psychological operations, and logistics (See Figure 1). The other part of the staff dealt with plans and operations, and focused on planning, directing the military operations of the territorial forces and associated support within the province. 22 The province chief exercised his authority through district chiefs. In order to provide advice and support to the district chiefs, the province senior advisor supervised the district senior advisors, who each had a staff of about eight members (although the actual size in each case depended on the particular situation in that district). The district-level advisory teams assisted the district chief in the military and civil aspects of the pacification and rural development program. Additionally, the district team advised and trained the regional and popular forces located in the district. At the end of 1967, a total of 4,000 US military and civilian personnel were involved in the CORDS advisory effort, but by late 1969, once Vietnamization was officially instituted, total US Army advisory strength stood at about 13,500. Half of these advisors were assigned to CORDS organizations.23 This increase was due to the expansion of the pacification program following the 1968 Tet Offensive. 23 In addition to advising CORDS operations, US advisors were also located with the RVNAF regular forces. 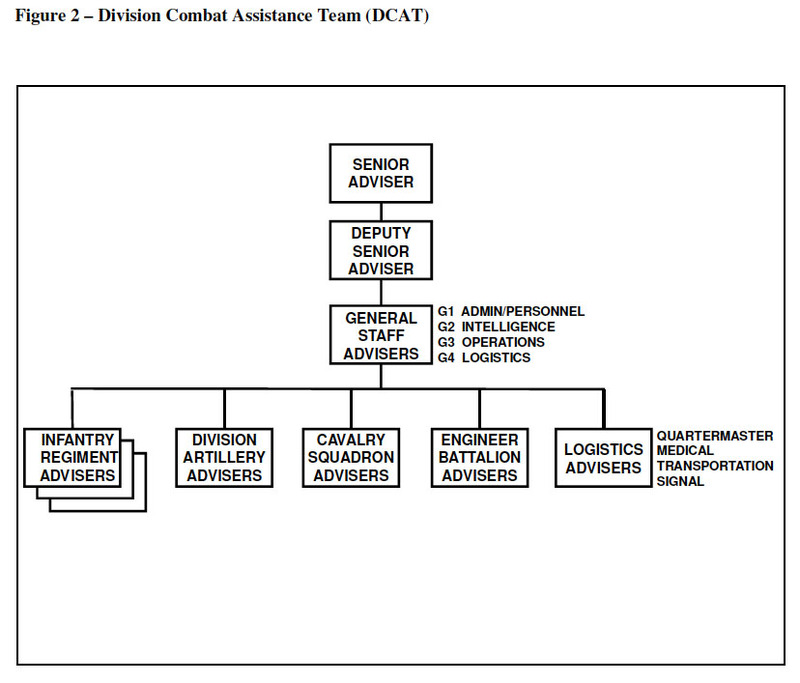 In January 1969, MACV, in an attempt to upgrade the capability of the regular ARVN divisions, initiated the Combat Assistance Team concept (See Figure 2). Under this plan, emphasis was placed on reducing the number of tactical advisors in the field and changing their mission from “advising to combat support coordination” at the ARVN division level. 24 The division Combat Assistance Team’s mission was to advise and assist the ARVN division commander and his staff in command, administration, training, tactical operations, intelligence, security, logistics, and certain elements of political warfare. The division senior advisor was usually a US Army colonel who exercised control over both the division staff advisors and the regimental and battalion advisory teams. 24 Each ARVN division usually had three infantry regiments, one artillery regiment, and several separate battalions, such as the cavalry squadron and the engineer battalion. The regimental advisory teams were normally composed of eight to twelve US Army personnel. 25 The regimental teams were usually led by a US Army lieutenant colonel and included various mixes of officers and non-commissioned officers. The separate battalion advisory teams usually consisted of one or two specialists who advised the South Vietnamese in their respective functional areas, for example, cavalry, intelligence, engineering, etc. 25 Elite ARVN troops, such as the airborne and ranger units, were organized generally along the same lines as regular ARVN units, but the highest echelon of command in these units was the regiment. 26 Each of these regiments was accompanied by an American advisory team, which was headed by a colonel and was similar to, but somewhat larger than those found with the regular ARVN regiments. The advisory structure for the Vietnamese Marine Corps was similar to the ARVN, but the advisors were US Marine Corps personnel. 26 US Army advisors did not exercise any operational command or control over any part of the ARVN forces. Their mission was to provide professional military advice and assistance to their counterpart ARVN commanders and staffs in personnel management, training, combat operations, intelligence, security, logistics, and psychological/civil affairs operations. The idea was that these advisory teams would work themselves out of a job over time as the South Vietnamese forces began to assume more and more responsibility for planning and executing their own operations. 27 Not only were advisors assigned to the CORDS effort and to the combat units in the field, there were also a significant number of advisors assigned to work with the RVNAF training base in an effort to improve the quality of training for the South Vietnamese forces. By the end of 1972, the RVNAF would become the largest and most modern military force in Southeast Asia, but even vast amounts of the best equipment in the world were meaningless if the soldiers, sailors, marines, and airmen did not know how to use it or did not have the leadership and motivation to put it to use in the field against the enemy. Even with the new policy in place, improving training was difficult to achieve. By the beginning of 1968, the ARVN training system consisted of 56 training centers of various types and sizes. There were nine national training centers (not including the airborne and marines who had their own training centers) and 37 provincial training centers. MACV, through its Training Directorate, provided US advisors at the RVNAF schools and training centers where they assisted RVNAF commandants preparing and conducting training programs. 28 The first real test of the South Vietnamese forces came in spring 1970 when 50,000 South Vietnamese troops joined 30,000 US troops in the invasion of Cambodia. During that operation, the South Vietnamese, accompanied by their American advisors and fighting alongside US forces, acquitted themselves very well. The next major test came in 1971 but the South Vietnamese did not do so well. In February, President Nixon and South Vietnamese President Thieu sent 17,000 South Vietnamese troops into Laos toward Tchepone along Highway 9 targeted against enemy base areas and critical sites along the Ho Chi Minh Trail. This action was considered to be the first true test of Vietnamization since the South Vietnamese troops attacked alone, without US ground troops or accompanying advisors. The operation started out reasonably well, but the North Vietnamese reacted quickly, throwing four divisions against the forces from 1 27 ARVN Corps. By April, the South Vietnamese were retreating in disarray. Despite the fact that Nixon proclaimed Vietnamization a success, ARVN performance in Lam Son 719 demonstrated that there was still a long way to go. 29 Emboldened by the events in Laos, the Military Committee in Hanoi decided to go for broke. On Good Friday, 30 March 1972, the North Vietnamese Army (NVA) launched a massive three-pronged attack with 130,000 troops against Quang Tri in the north, Kontum in the central highlands, and An Loc, just 65 miles from Saigon. This offensive was characterized by high intensity conventional operations that included the use of tanks, SA-7 Strela heat-seeking missiles, and myriad other sophisticated weaponry obtained from China and the Soviet Union. The subsequent fighting was bitter and the NVA ultimately captured Quang Tri. However, in the end, the South Vietnamese forces, bolstered by their US advisors and supported by a massive American air campaign, prevailed and held Kontum and An Loc against repeated attacks. They re-took Quang Tri in September. 30 Nixon had the victory he was looking for and he subsequently declared Vietnamization a resounding success, thus providing him the rationale for US withdrawal from Viet Nam. In early 1973, the Paris Peace Accords were signed and all US troops were withdrawn by 31 March. The war, however, was not over for the Vietnamese. It continued to rage for two more years. The South Vietnamese, without the support promised by Nixon, held their own throughout 1973 and into 1974 but when the North Vietnamese launched their last major offensive in March 1975, the South Vietnamese succumbed in 55 days. 31 Given the outcome of the war in Viet Nam, the obvious question is what is to be learned from this experience? It has already been acknowledged that there are more differences than similarities between Viet Nam and Iraq and/or Viet Nam and Afghanistan. Still, there are many valuable lessons to be learned from the advisory experience in Viet Nam that can inform the challenges for contemporary advisory efforts in Afghanistan and Iraq. 32 The first and central lesson drawn from the US advisory effort in Viet Nam is that there must be some systematized approach to building an advisory structure. 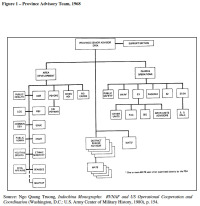 In Viet Nam, during the early days of the advisory effort, an ad hoc approach to putting together the advisory structure existed. By 1969, with the institution of Vietnamization, the structure had been refined and solidified, but it was established in fits and starts, and the advisory mission suffered accordingly, particularly during the years when MACV focused on US combat operations. 33 Part of establishing a viable and effective advisory effort is selecting and training the right personnel to meet the unique demands of the advisory mission; not everyone has the training, experience, maturity, and temperament to be an effective advisor. The selection of officers and non-commissioned officers to be advisors must involve a conscious process to find the right personnel to fill these crucial assignments. In a 1965 RAND study, Gerald C. Hickey delineated the requirements for being an effective advisor. These included professional competence and experience, adaptability to foreign cultures, the ability to work with foreign nationals, and language skills. Additionally, Hickey recommended that those selected for advisory duty be volunteers. 28 Once the right personnel are selected, there is a need for a comprehensive training program that focuses on preparing the advisor for the cultural obstacles they will encounter. 29 This is true whether the culture is that of Viet Nam or Afghanistan. The training must address those aspects of the culture that are least familiar to the advisor, including customs, traditions, history, religion, ethnic groups, government, etc.30 By the latter years of the war in Viet Nam, the US Army had greatly improved training for advisors, instituting a family of courses designed to prepare officers for the different advisory missions whether they were with CORDS, the training base, or South Vietnamese combat units. 31 The advisor should especially be trained for language skills, as language impacts everything the advisor does. In Viet Nam, one of the most significant effects language skills had was on the ability of the advisors to establish a quick rapport with their Vietnamese counterparts. Rapport was key to the overall effectiveness of the advisor. Language skills greatly enhanced the ability of the advisor to rapidly establish the good rapport and influence that is so critical to accomplishing the advisory mission. 34 Time is crucial and is directly related to advisor effectiveness. In Viet Nam, the US found that the one year tour was not of sufficient length to build rapport and achieve a level of trust needed to improve the advised unit. The advisory effort takes a long time and the nation must be prepared to underwrite that commitment if the advisory effort is to have any real success in addressing the long-term problems encountered building effective indigenous forces. Time is also important at the strategic level. In Viet Nam, an established army already existed, but still the advisory effort required an extended period of time to show progress. When involved in advising another nation’s defense forces, the United States and the army must be willing to stay the course if the advisory effort is to have any chance of real success. 35 For the advisor on the ground, there is a tension between advising and being completely honest in assessing one’s counterpart and his unit. The need to show progress, be positive, and maintain rapport and influence with the counterpart sometimes gets in the way of a candid evaluation of the force being advised. This can lead to difficulties when the unit is not up to the tasks expected of it. Additionally, overly optimistic reporting may result in a failure to address the systemic problems that may exist in the unit. Part of the solution is a standard method for rating the morale and combat effectiveness of the indigenous units. 36 Finally, the advisor must always remember that he is an advisor, not a commander. The advisor can only give his best military advice and hope that his counterpart responds to that advice. This means that the advisor’s senior leaders must also realize that there are limitations on what the advisor can do. Furthermore, as the advisor tries to build a good rapport with his counterpart, he must avoid making the counterpart and his unit too dependent on the advisor and what he brings to the table in the way of what is today called the enablers. It can be argued that the US advisory effort in Viet Nam made the South Vietnamese too dependent on American combat support and that this dependence contributed to their defeat in 1975 when US support was no longer present. 37 In conclusion, there are many lessons that can be drawn from the American advisory effort in Viet Nam that can assist in the current effort in Afghanistan. Perhaps the most important lesson that should be kept in the minds of those charged with this critical duty is attributed to T. E. Lawrence of Arabia: “Better they do it imperfectly than you do it perfectly, for it is their country, their war, and your time is limited.” That was a lesson that became only too clear during America’s advisory experience in Viet Nam. It is just as true today. Whether that lesson and the others enumerated here have been learned remains to be seen. Dr. James H. Willbanks is the General of the Armies George C. Marshall Chair of Military History and Director of the Department of Military History at the US Army Command and General Staff College, Fort Leavenworth, Kansas. 1 George C. Herring, America’s Longest War: The United States and Vietnam, 1950-1975, Fourth Edition(New York: McGraw-Hill, 2002), p. 51. 2 The Vietnamese National Army (VNA) was created in 1949 by the French out of units that had been native auxiliaries to the French Union Forces. 3 In October 1955, the Vietnamese National Army was re-organized into The Army of the Republic of Vietnam (ARVN) by South Vietnamese Premier Ngo Dinh Diem. 4 Ronald H. Spector, Advice and Support: The Early Years, 1941-1960 (Washington, DC: US Army Center of Military History, 1983), p. 263. 5 Cao Van Vien, Ngo Quang Truong, Dong Van Khuyen, Nguyen Duy Hinh, Tran Dinh Tho, Hoang Ngoc Lung, and Chu Xuan Vien, Indochina Monographs: The US Adviser (Washington, DC: US Army Center of Military History, 1980), p. 28; Spector, Advice and Support: The Early Years, pp. 295-302. In 1961, two new infantry divisions and a fourth corps headquarters were activated to cope with the growing insurgent threat. 6 Jeffrey J. Clarke, Advice and Support: The Final Years, 1965-1973 (Washington, DC: US Army Center of Military History, 1988), p. 62. 8 Vien,Truong, Khuyen, Hinh, Tho, Lung, and Vien, The US Adviser, p. 70. 9 Spector, Advice and Support: The Early Years, p. 295. 10 HQ, USMACV, “Command History 1966,” 30 June 1967, p. 452; Jeffrey J. Clarke, Advice and Support: The Final Years, p. 145. 11 Clarke, Advice and Support: The Final Years, p. 187. 12 Vien, Truong, Khuyen, Hinh, Tho, Lung, and Vien, The US Adviser, p. 8. 13 BDM Corporation, A Study of Strategic Lessons Learned in Vietnam, vol. 6, Conduct of the War, book 2, Functional Analyses, April 1980, pp. 12-10; Clarke, Advice and Support: The Final Years, p. 61. 14 Stuart A. Herrington, Silence Was a Weapon: The Vietnam War in the Villages (Novato, CA: Presidio Press, 1982), p. 191. 15 Some numbers range as high as 40,000 killed in the fighting that extended into the fall of 1968. 16 Clarke, Advice and Support: The Final Years, p. 369. 17 Memo, Secretary of Defense Laird to the Service Secretaries, 16 December 1969, “Quantity and Quality of US Advisors in Vietnam,” Abrams Papers, US Army Center of Military History. 18 David Fulghum and Terrence Maitland, The Vietnam Experience: South Vietnam on Trial, Mid-1970 to 1972 (Boston, MA: Boston Publishing Company, 1984), p. 56. 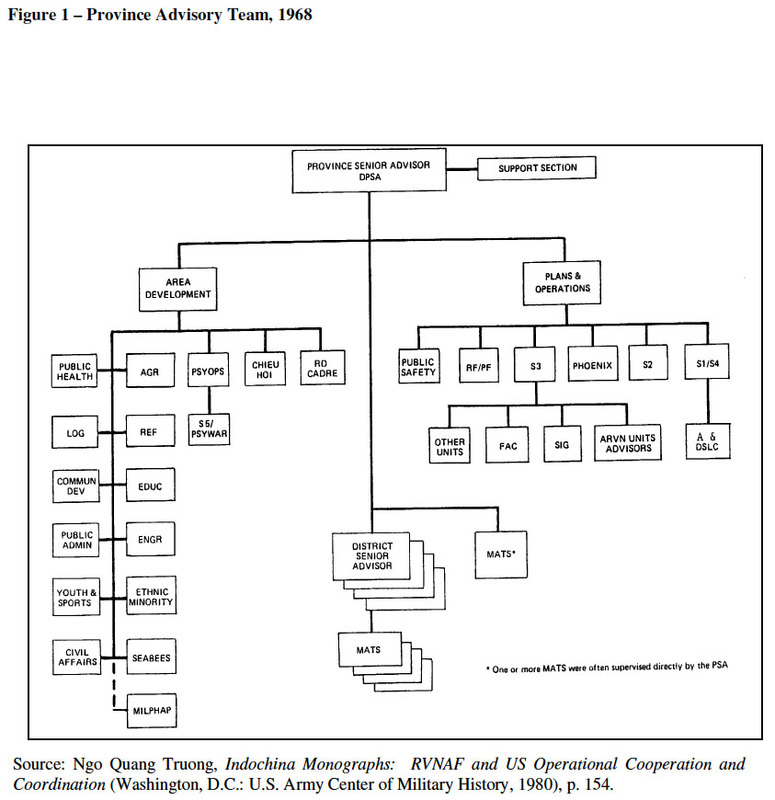 19 USMACV, “Command History, 1970,” Vol. 2, VII-63 to VII-79. 20 Vien,Truong, Khuyen, Hinh, Tho, Lung, and Vien, The US Adviser, p. 10. 21 The senior US commanders were III Marine Amphibious Force Commander in I Corps, I Field Force Commander in II Corps, and II Field Force Commander in III Corps. In IV Corps, there was never a corps-level headquarters, but there was a designated US Army major general who served as the senior advisor to the IV Corps commander. 22 Vien,Truong, Khuyen, Hinh, Tho, Lung, and Vien, The US Adviser, p. 49. 24 Fact Sheet, MACMA-PP, 13 August 1969, “Combat Assistance Team (CAT),” Records of the Military Assistance Command Vietnam, Part I (Microfilm Edition), Reel 40/Frame 0983. 25 They were eventually reduced in strength as the drawdown of US forces in country gradually reduced the number of advisors assigned. 26 Toward the end of the war, the airborne regiments and the marine brigades were aggregated into the Airborne and Marine Divisions respectively. 27 Gerald C. Hickey, The American Military Advisor and His Foreign Counterpart: The Case of Vietnam (Santa Monica, CA: RAND Corporation, March 1965), p. xii. 28 Robert D. Ramsey III, “Advising Indigenous Forces: American Advisors in Korea, Vietnam, and El Salvador,” Global War on Terrorism Occasional Paper No. 18. (Fort Leavenworth, KS: Combat Studies Institute Press, 2006), p. 59. This is an excellent and comprehensive study of three major American advisory efforts that provides a detailed discussion of specific lessons learned in each case. 29 Hickey, The American Military Advisor,pp. xii-xv. 30 Brigadier General John S. Brown, “Historically Speaking: The Vietnam Advisory Effort,” Army (March 2006), pp. 94-95. 31 Quotation of T. E. Lawrence, by Col. E. F. Pelosky, USA Chief Army Division, in Defense Attache Office, US Embassy Saigon, “Army Division Final Report,” Executive Summary, 18 June 1975, US Army Center of Military History.